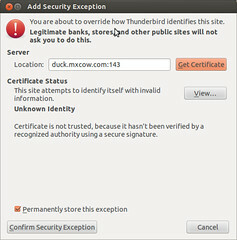 Yesterday, Thunderbird popped up a stern certificate warning message stating that the "certificate is not trusted, because it hasn't been verified by a recognized authority using a secure signature". That's interesting -- I've used this certificate for close to a year now (it expires in a couple of months) and hadn't made any changes. After examining the certficate details for longer than I would care to admit, finally realized that the problem was with the Intermediate CA certificate (it expired on 2012-10-22), not my host certificate which is still good. I use a StartSSL certificate on the web server as well and it was the same problem there. Fortunately, fixing this was easy. Then confirmed it's ok using a web browser. Nice. One thing that was interesting is that when I refreshed the page, Firefox (version 16 for Linux) picked up the change, while Chrome (Chromium 20 for Linux) didn't, not even after a restart -- had to clear the cache (Settings > Privacy > Clear browsing data... > Empty the cache), before the certificate warning went away. Now after restarting my Thunderbird mail client and examining the certificate (Edit > Settings > Security > View Certificates > Authorities > StartCom Ltd. > StartCom Class 1 Primary Intermediate Server CA > View > Validity) shows new expiration date of 10/24/2017. Nice. You are about to override how Thunderbird identifies this site. Certificate is not trusted, because it hasn't been verified by a recognized authority using a secure signature. Thx, helped me to fetch news from my preferred news server again.